In Heaven, everything will be spring as far as beauty is concerned, autumn as far as enjoyment is concerned, summer as far as love is concerned. There will be no winter; but here winter is necessary to exercise self-denial and a thousand other little but beautiful virtues which are exercised at times of sterility. Yvette Levasseur experienced sadness and hardship from her earliest years. Her parents both died when she was just a child. After her parents’ death, her aunt and uncle who lived in Paris, France adopted her. Yvette moved from her home in Great Britain to live with them. Her aunt and uncle owned a small business in the downtown section of Paris where they made shoes for the handicapped. Yvette soon learned the trade and was able to help them in the shoe shop. When Yvette was sixteen years old, her aunt passed away from cancer. Just two years later, her uncle also died. Yvette was on her own and very much alone in the big and bustling city of Paris. She gained strength by attending daily Mass at Our Lady of Victories parish. After her aunt and uncle died, Yvette continued to make shoes. She lived alone in a tiny room above the shoe shop. It was a struggle to keep the business going and she barely had enough money for necessities. At times, bread and milk were her only staples as she could afford no more.One day at the bookstore in the parish of Our Lady of Victories, Yvette saw a book on Padre Pio. It looked so interesting that she purchased it. After she read the book, she had a great desire to visit Padre Pio in San Giovanni Rotondo. However, she knew it would be impossible as she did not have the financial means to make such a trip. By a stroke of luck, shortly after reading the book, she met a couple who were going to San Giovanni Rotondo. They invited her to go with them and she happily agreed. The year was 1958. She was able to attend Padre Pio’s Mass and to experience what she called the “true greatness” of Padre Pio’s presence. After Yvette returned to Paris, she wrote a letter to Padre Pio asking for his prayers. She received a letter back which said that Padre Pio was praying for her and that he sent her his blessing. Shortly after, Yvette was offered a job. A woman wanted to hire Yvette to accompany her family on a two-month holiday trip to Savoia and tutor her two small children. Yvette.thought that it would be to her advantage to accept the job but first she wanted Padre Pio’s approval. She wrote to Padre Pio and asked him for advice. Soon a letter came back in the mail. “Do not take the job; remain in Paris,” were Padre Pio’s words of counsel. Yvette followed his advice. Meanwhile, business at the shoe shop continued to decline. Yvette decided that it would be better to sell the business and get what money she could out of it rather than continue on a downward spiral and possibly lose everything. She wrote to Padre Pio again and asked for his advice. Once again, the answer from Padre Pio was a definite “no.” Yvette trusted Padre Pio completely and did not put the business up for sale. A third opportunity soon presented itself. A woman wanted to hire Yvette to work as an assistant in her boutique in Luxembourg. To Yvette, it sounded like a good opportunity. It.would mean that she would have to leave Paris, but she didn’t mind. It was proving to be too difficult for her to make a living there. For the third time, she asked Padre Pio for advice and for the third time, his answer was “no.” Yvette decided to obey him blindly.Shortly after that, Yvette met a very nice man in Paris named Maurice. Before long, they married. Much to Maurice’s surprise, shortly before the wedding, he inherited a very profitable business from one of his relatives. Because of the inheritance, Maurice and Yvette were able to live very comfortably. The financial worries that had plagued Yvette for so long, were over for good. Soon their marriage was blessed with a beautiful son. Yvette returned to San Giovanni Rotondo to thank Padre Pio for his prayers and for her many blessings – her loving husband and her new son. To their great joy, Yvette and Maurice were blessed with two more children. When Yvette thought about her life and all that had happened to her, it became clear to her why Padre Pio had advised her to stay in Paris. It was in Paris that she met her wonderful husband, Maurice. If she had accepted the job opportunities that had presented themselves, she would have had to leave Paris. If she had left Paris, her life would have taken a completely different turn. How happy she was that she followed Padre Pio’s advice. After losing her parents and her aunt and uncle when she was young, Yvette had a great desire for a family of her own. Because she had experienced loneliness and personal loss in her youth, she knew the value and the blessing of family life. A good family was a true gift from God. Yvette would never take her family for granted. She had trusted Padre Pio enough to follow his counsel, even though at the time, his advice seemed hard to understand. In the end, his guidance proved to be perfect. In 1947, Nicola De Vincentis worked as the head station master at the San Severo train station in Italy. One morning upon rising from bed, Nicola’s legs gave way from under him and he collapsed on the floor. His entire body felt paralyzed. He was seen and examined by a number of doctors. None however, were able to determine the cause of his problem. Finally, Nicola was advised by his primary doctor to travel to Rome to see the highly-esteemed and well-known neurologist, Dr. Ugo Cerletti. Dr. Cerletti diagnosed Nicola with the tropical virus, “poliradicdaneurite.” The long-term effects of the virus were severe and Dr. Cerletti tried to break the news as gently as he could to Nicola. He told Nicola that he would never be able to recover completely from the virus. He believed that with therapy, Nicola would someday be able to walk again. However, he was certain that Nicola would have to use crutches for the rest of his life. Unfortunately, it would be impossible for him to continue working at the San Severo train station. Nicola was put on an intense physical therapy program which included galvanic stimulation, leg, thigh, and arm massage, and injections. Very slowly, his condition began to improve as movement returned to his body. He had a problem with his equilibrium which caused him to feel dizzy most of the time. Because he was so unsteady on his feet, he was advised to use a walker for support. After a five-month stay at the rehabilitation clinic, Nicola was finally released. Shortly after returning to his home, he tripped and broke his right foot. He had to go back to the clinic where he spent another forty days. A short time later, the Foggia Administration of Health gave him a thorough physical examination and officially declared him to be disabled. He would never be able to return to his job as station master. The ruling was very difficult for Nicola to come to terms with. Thinking about the loss of his job and his uncertain future, filled him with great anxiety. Nicola’s friend, Father Placido of San Marco in Lamis, who lived at the Capuchin monastery in San Severo, advised him to visit Padre Pio. Nicola had heard of the saintly priest but he knew very little about him. By this time, he had been suffering from the tropical virus for eighteen months. As a last resort, he decided to accept Father Placido’s suggestion to see Padre Pio. Nicola and Father Placido took a bus to San Giovanni Rotondo. The bus driver would not take them up the hill to the monastery of Our Lady of Grace because the road was in such poor condition. Instead, they were dropped off at a crossroads with no choice but to walk the rest of the distance to the monastery. Holding tightly to Father Placido’s arm as well as using a cane for support, Nicola made a great effort to walk up the hill. However, after taking just a few steps, he lost his balance and fell to the ground. It became clear that he was not going to be able to walk. Father Placido had no resort but to carry Nicola on his back all the way up the hill. Although he was elderly, Father Placido managed to get Nicola up the incline and to the monastery. When Nicola and Father Placido finally arrived at Our Lady of Grace monastery, they found Padre Pio taking a few moments of leisure in the monastery garden. Upon being introduced to Nicola, Padre Pio embraced him lovingly. He asked Nicola to sit next to him on the garden bench. Nicola then told Padre Pio about his illness and all that he had suffered since he had contracted the tropical virus. The next morning, Nicola and Father Placido attended Padre Pio’s Mass. Padre Pio made special arrangements for Nicola to sit in a chair that was placed very close to him at the altar. Father Placido and Nicola had to return by bus to San Severo after the Mass. Father Placido wanted to make sure that Nicola had a chance to say goodbye to Padre Pio. However, Padre Pio had retired to his cell after the morning Mass and nobody was to disturb him. Father Placido took Nicola to the private quarters of the monastery and knocked on Padre Pio’s cell door. “Padre Pio, Nicola and I are leaving now by bus for San Severo. Nicola would like to say goodbye to you,” Father Placido said. Padre Pio opened the door immediately. He gave Nicola a blessing and said to him, “Trust in the grace of the Lord.” He then added, “When you get home, I want you to take a ride on your bicycle. After that, you should make another request for a medical examination from the office of the Central Administration of Health in Rome.”Nicola thought deeply about Padre Pio’s words. Padre Pio’s suggestion that he ride a bicycle seemed like very strange advice. For a man in Nicola’s condition, riding a bicycle was a dangerous proposition. Even if he wanted to, Nicola was quite certain that he would not be able to manage it. He had not even been able to walk up the hill to Padre Pio’s monastery. Father Placido had carried him up. Nicola still had problems with his equilibrium and balance. He had frequent dizzy spells. Padre Pio must have been joking to suggest that he ride a bicycle. But Nicola knew that he wasn’t joking. It was obvious that he was perfectly serious. On the return trip to San Severo, Father Placido and Nicola discussed the matter. Father Placido had known Padre Pio for a long time and had full confidence in him. He encouraged Nicola to do what Padre Pio had advised him to do. “Padre Pio told you to trust in the grace of the Lord,” Father Placido said. “You must follow his advice. Pray about it as well. He has his own reasons for asking you to ride a bicycle. I think you should do what he said.” Nicola prayed for guidance. After praying, he seemed to have a great boost of faith and greater confidence in Padre Pio. He decided to follow Padre Pio’s unusual advice. Upon returning home, Nicola got his bicycle out. He waited till the late evening when all of his neighbors had gone indoors. He did not want to make a spectacle of himself. He got on his bicycle and rode it about one hundred yards before taking a fall. He hit the ground so hard that he was almost knocked unconscious. Thinking that he might be dying, he prayed and begged God for help. All of a sudden, he felt someone lift him up from the ground and place him back on the seat of his bicycle. But how was it possible? He was alone. There was no one in sight. Back on the bicycle, he found that he could pedal it with ease. His joints and limbs suddenly felt flexible. The muscle constriction and paralysis had disappeared and he felt strong and energized. His equilibrium had also returned. He knew at that moment that he had been healed. Like Padre Pio had asked him to do, Nicola went to the Railway Health Administration of Rome and made a request for another medical examination. He marked down on his application that he had received a miraculous healing. A number of doctors and neurologists examined him, under the supervision of Dr. Ugo Cerletti. They were dumbfounded by.the change in his condition. After a thorough examination, he was declared fit to resume his job. He returned to his position as head station master at San Severo and worked there until he reached retirement age. He remained in excellent health, free from any symptoms of the tropical virus. He remained a devoted spiritual son of Padre Pio for the rest of his life. I was born in Brooklyn, New York and grew up on Long Island, in New York. Somewhere along the way, I heard about Padre Pio and I had a great desire to meet him. I took it upon myself to learn the Italian language so that I could communicate with him. I visited him on four different occasions in San Giovanni Rotondo. The first time I went to San Giovanni Rotondo and walked into the church of Our Lady of Grace, I could perceive the strong smell of blood. I attended Padre Pio’s Mass and I was very impressed by the reverence with which he celebrated the Mass. The Mass lasted a very long time. After Mass, I waited to make my confession to Padre Pio. The mens’ confessions were face to face and were held in the sacristy of the church. While waiting in line, I heard Padre Pio shout at the man who was making his confession. Padre Pio raised his voice and said, “What was that you said you did?” All of us who were standing in line felt very sorry for the man. We all backed up in the line so as to give the man more privacy. For his sake, we wanted to make sure that we did not hear his reply to Padre Pio’s question. I was nervous when I made my confession to Padre Pio for the first time. Padre Pio was very calm as he heard my confession. It only lasted a few minutes. Later, I asked Padre Pio about the desire I had to become a priest. I wanted to know if he thought that I had a vocation to the priesthood. “Yes, you must become a priest,” he said. “You must go to the bishop and insist that you be ordained.” I was very shy by nature. I did not feel that I had the courage to insist on anything to a bishop. But because of the advice Padre Pio gave me, I finally spoke to the bishop. After I completed all my theological requirements, I was ordained to the priesthood. 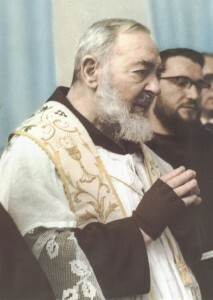 Before the Mass, Padre Pio would always take his gloves off. Sometimes, a scab from the stigmata on his hands would detach itself and fall to the floor when he removed his gloves. People who were nearby watched for this, and if a scab fell to the floor, they would rush to get it. It was a precious first class relic. Padre Pio would rarely allow people in his company if they were living immoral or sinful lives, and had no desire to change. He would often send people away with strong words. Many were offended, but almost all returned. He was truly guided by God in his dealings with others. He had the gift of reading hearts, of prophecy, and of discernment of spirits to a remarkable degree. If he counseled a person, he spoke in a direct manner. He did not want to repeat his words. I went to San Giovanni Rotondo four times. Each time I was able to make my confession to Padre Pio. While in San Giovanni Rotondo, I visited Mary Pyle. Mary lived in a home very close to the monastery and had dedicated her life to Padre Pio. Mary was a member of the Third Order of St. Francis. She spoke to me a lot about the Third Order. I was inspired by Mary’s words and because of her encouragement, I became a member of the Third Order of St. Francis. I had an undiagnosed illness when I visited Padre Pio in San Giovanni Rotondo. I was not healed of my illness but I received much more that a physical healing. As time went by, I realized the true spiritual greatness of Padre Pio. I have read more than thirty books on his life. I know of no other saint in history that has been given the spiritual gifts that the Lord gave to Padre Pio. I realize how truly blessed I was to meet him. I joined the Order of the Servants of Mary (Servites) and was ordained to the priesthood on May 17, 1941. In 1954, I was appointed as Assistant General of the Servite order. I was sent to Rome and spent six years at this assignment. Two times I traveled from Rome to San Giovanni Rotondo to visit Padre Pio and make my confession to him. I spoke Italian and I was glad that there would be no language barrier. I also wanted to talk to Padre Pio about the many problems I encountered as Assistant General for the Servites. It was a difficult job in many ways. I felt that Padre Pio could help me with his advice. The beautiful altar of St. Francis where Padre Pio celebrated Mass for many years. Padre Pio did indeed help me. He gave me advice which I have never forgotten, even after these many years. He said to me, “Always, and in all circumstances, be obedient to your superiors.” It was his habit to say a few simple words but his words were filled with wisdom. 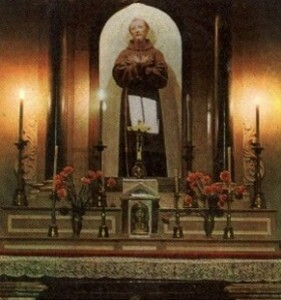 At the time I visited San Giovanni Rotondo, Padre Pio said Mass at the side altar of St. Francis at the monastery of Our Lady of Grace. When it was time for the Mass to begin, Padre Pio came out of the sacristy with two Capuchins, one on either side. It was apparent to me that they were there to protect him. They reminded me of bodyguards. Padre Pio said the Mass very slowly with many long periods of silence. He went into ecstasy several times during the Mass and became completely still. I had made arrangements with the Capuchins to say my Mass after Padre Pio was finished with his. At the conclusion of his Mass, the same two Capuchins stood one on either side of him and escorted him back into the sacristy. The simple side altar of St. Francis had just the bare essentials – an altar cloth, two candles, water and wine, and a crucifix. As Padre Pio walked toward the sacristy, I approached the simple altar where he had just said Mass. As I did, I perceived the beautiful fragrance of roses filling the church. It was a heavenly fragrance, not of this earth. I knew that it was a special blessing imparted by Padre Pio for all who were in the church that day. Not long ago, I was hearing confessions at St. Anne’s parish on a Friday, in the middle of the summer. It happened to be a very hot day. We do not have air conditioning at the parish and it can become quite uncomfortable in the summer time. In the confessional, it can be even more stifling. The confessional is built with maximum insulation in order to be sound proof for the sake of the privacy of the penitent. That means it is also to some degree “air proof.” On this particular day, in that very uncomfortable heat, I suddenly felt a very cool breeze coming down from the top of the confessional. I would describe it as “sprinkling down,” bringing me a great deal of relief. The cool air flowed only from the top. The sides of the confessional were not affected. I was startled by the gentle and cool breeze. Before I became a priest, I was an engineer. I wondered, from the perspective of an engineer, how a breeze could possibly come be coming from the top of the confessional. I began to analyze the situation but I could come to no conclusion. This entry was posted in Newsletter Archives by Editor. Bookmark the permalink.